Well done to our Y5/6 football team who competed at the South Doncaster Semi Finals on Thursday 27th September with great enthusiasm and spirit, winning and drawing most of their matches, with a couple of losses along the way, to finish mid-field. Well done to our cross country teams, as they competed with great success at the Keep Moat Stadium on 11th October 2018. Year 3 / 4 girls - Congratulations to Isobel L who came 4th out of 90 competitors. Our team came 4th and go through to the South Yorkshire Finals. Year 3 / 4 boys - Congratulations to Jacob T who came 4th and Joe W who came 5th out of 90 competitors. Our team came 4th and go through to the South Yorkshire Finals. Year 5 / 6 girls - Well done to our girls' team as they all completed the course, competing against 108 runners. Year 5 / 6 boys - Congratulations to Luke B who came 5th, Charlie L who came 7th and Luke C-S who came 8th out of 107 competitors. Our team came 1st overall and go through to the South Yorkshire Finals. Miss Hull and Miss Newton would like to congratulate all the children who represented the school so well and also to thank all the parents/carers who came to give such fantastic support. Our Year 6 Athletics team had a very active afternoon at Dearne Valley Leisure Centre on Thursday 31st January 2019 as they competed in the Semi Finals of the Doncaster Indoor Athletics Tournament in a great variety of track and field events. The tournament was a very competitive event with three heats in many events to reach the finals and Miss Hull reported that she and Miss Newton were so proud of the children’s sporting behaviour, team work and support of each other. Well done to all the pupils in the team, who achieved 3rd place overall in the event. Many congratulations to our Year 3-6 cross country teams who competed in the county finals on 5th February following their earlier success at the Doncaster Championships. On a decidedly chilly afternoon, our intrepid teams competed at the South Yorkshire Finals at Cannon Hall against finalists from across Doncaster, Barnsley, Rotherham and Sheffield. This was a great opportunity for our pupils to compete at an elite event. We are so proud of all the children as they demonstrated great effort, stamina, enthusiasm and sporting behaviour. All children completed the challenging course, with a number of placings in the top twenty. Well done to everyone! Congratulations to our Gym Team - County Champions! Our gymnastics club has been very popular once again this year and there was a keenly contested intra-school competition to select our gymnastics team. Well done to members of the gymnastics team who have done so well to compete at county level by reaching the Yorkshire Championships in March 2019. In 2017 we competed at county level and our team came 3rd for the whole of Yorkshire, our team came 2nd for the whole of Yorkshire in 2018 and in 2019 I am very proud to share that the team came first and are now County Champions for the whole of Yorkshire! Amazing! Congratulations to the team and many thanks to Miss Hull, for giving her time after school to coach the team. The gym team will now compete in the National Gymnastics Finals! Please click on the video clip below to view one of the team's training sessions. Well done to our cross country team, as they competed at Sunnyfields Primary on 28th September 2017 in our first tournament of the school year with great success. 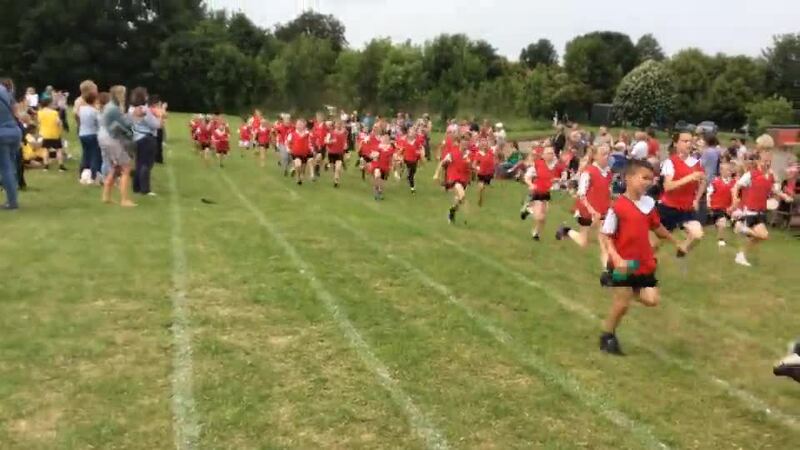 The points were then totalled from all the Year 3 / 4 and Year 5 / 6 girls’ and boys’ races. Well done to everyone in the team for competing with determination and enthusiasm and for demonstrating great sporting behaviour. Cross Country Success – County Finalists! Well done to our cross country team, as they competed on 5th October 2017 at the Doncaster cross country finals. There are over 100 primary schools across Doncaster and, as champions of two pyramids, our pupils competed against over 400 pupils in 23 teams at the Doncaster Finals. The Year 3 / 4 girls’ and boys’ teams will now compete at the county finals. We are very proud of our sporting success at Copley as we are now competing at county level in three areas – cross country, gym and cricket. Well done to our football team, who competed against over 20 school teams at the Year 5/6 Doncaster Football Championships on 27th October 2017. The team lost one match, drew in all their other matches and great team work led to a fantastic goal. The team demonstrated fantastic sporting behaviour throughout and were a credit to our school. Many congratulations to our Year 3-4 cross country teams who competed in the county finals on 7th February following their earlier success at the Doncaster Championships. On a decidedly chilly afternoon, our intrepid teams competed at the South Yorkshire Finals at Cannon Hall against 550 finalists from across Doncaster, Barnsley, Rotherham and Sheffield. This was a great opportunity for our pupils to compete at an elite event. We are so proud of all the children as they demonstrated great effort, stamina, enthusiasm and sporting behaviour. Our Year 3-4 boys came third in county, which is a fantastic achievement! Congratulations to our Gym Team - Success at County Level! Our gymnastics club has been very popular once again this year and there was a keenly contested intra-school competition to select our gymnastics team. Well done to members of the gymnastics team who have done so well to compete at county level by reaching the Yorkshire Championships in March 2018. In 2017 we competed at county level and our team came 3rd for the whole of Yorkshire! In 2018 we are proud to announce that the team came 2nd for the whole of Yorkshire! 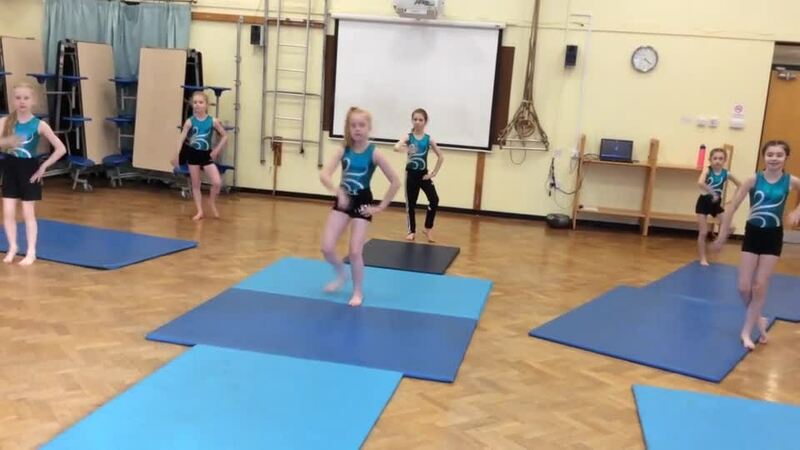 Click on the video clip below to see the Gym Club in action! A huge well done to all our cross country teams who competed on a very warm and sunny Saturday 17th May at this huge sporting event. The children all demonstrated great perseverance, determination and team work so well done to everyone who took part. Special congratulations to Luke B who won the entire Under 9 race and to Charlie L who came 4th. We had a fantastic level of support from parents and relatives at our Sports Afternoon on 13th June 2018. Children had an active afternoon, taking part in cricket and rounders matches as well as track events and our exciting spoke relay event. The children displayed excellent sporting behaviour throughout. Congratulations to Hawking House who will have the red ribbons on our Sports Day trophy until next year. Click on the first image below to view our gallery of Sports Day photographs. Click on the video clip below to view Hawking House's lap of honour! Our Year 6 pupils competed in the South Doncaster Cricket Tournament on 14th June 2018. The team won two games and lost two, one of these to the overall winners of the event. The team all played well and demonstrated fantastic sporting behaviour throughout, coming 5th in South Doncaster. Well done to children in every year group who were chosen to represent us at Active Fusion’s Sports Festival at the English Institute of Sport in Sheffield. This gave our pupils opportunity to engage in sports in the same facilities as Olympic Champions! We represented Denmark on this occasion. Well done to all the children, who as always took part with enthusiasm and demonstrated great team spirit and sporting behaviour throughout the day. Well done to our netball team who competed against over 100 schools in Doncaster's Netball Tournament on 27th June. They displayed both competitive and sporting behaviour and came 6th in the whole event. Our Athletics team competed in the Doncaster Athletics Tournament at the Keep Moat Stadium on 28th June, taking part in a wide range of events including 80m sprint, 600m, obstacle race, shuttle relay, long jump, javelin throw and ball throw. There are over 100 schools in Doncaster and our team came 7th, so congratulations to the team. Our children showed great team spirit and fantastic sporting behaviour so well done to everyone. We share our sports competition involvement and success on the display board below. Well done to our Athletics team who competed against other local schools at Dearne Valley. Our pupils demonstrated enthusiasm and excellent sporting behaviour throughout, achieving good success in some events and they gained 3rd place overall. As part of their project on 'Gods and Mortals', a History based project on Ancient Greece, our two Year 3 classes completed an ‘Olympic style’ competition using javelins, discus and shot put. We were very impressed with the skills of the pupils. Stanley came first in the discus throwing a distance of 15.4m (he actually came in second place too! ), Drew threw the longest javelin distance with 12m and Eric was the winner of the shot competition with a distance of 11.3m. 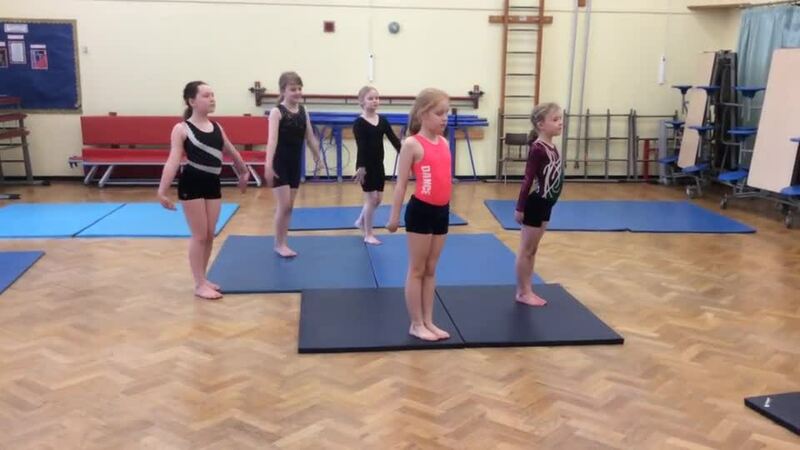 Our gymnastics club has been very popular once again this year and there was a keenly contested intra-school competition to select our gymnastics team. Well done to members of the gymnastics team who have done so well to compete at county level by reaching the Yorkshire Championships. The children's performance was excellent and we are very proud to share they came 3rd for the whole of Yorkshire! We are delighted that 51 children joined our extra curricular cross country club. During their training sessions children developed their technique and stamina and we saw great effort in our intra-school competition to select our 2017 cross country team. Our team took part in Doncaster’s Cross Country Championship and competed with determination, demonstrating great sporting behaviour. Our team was placed 3rd overall for the whole event so congratulations to everyone. Thank you to Miss Hull and other staff members who gave their time on Saturday to cheer on the team. I am sure you will agree that the team look very smart in their new team tabards, kindly funded by one of our parents. Well done to our cricket team who competed successfully against other schools to become Ridgewood Pyramid Cricket Champions. Our team progressed to the Doncaster Finals and the team won that also, so we are now Doncaster Cricket Champions. We then played in the county finals in Leeds and we are proud to share the team came 10th for the whole of Yorkshire. Sprint: Too close and too many to call! Miss Keep has recorded all the children’s scores so that when we hold our Intra-School Multi Skills Competition in 2018 the children can keep track of their sporting improvements year on year. Blue ribbons for Einstein House have been tied to our new trophy which is displayed in our trophy cabinet. We wait to see which House will triumph in our 2018 Multi Skills Competition! We had a fantastic level of support from parents and relatives at our Sports Afternoon. Children had an active afternoon, taking part in cricket and rounders matches as well as track events and our exciting spoke relay event. The children displayed excellent sporting behaviour throughout. As part of our local partnerships in P.E. and Games, we were invited to take part in an inter-school Sports Festival at the National Institute of Sport in Sheffield. This was a great opportunity for children to engage in sport with other schools at a world class sporting facility. Each school represented a different country – we embraced Jamaica! The School Games Mark is a Government led awards scheme that aims to reward schools for their commitment to the development of competition across their school and into the community. In July 2017 we achieved the Bronze School Games Award.